Jesus said, ” I am the living bread which came down from heaven: if any man eat of this bread, he shall live for ever: and the bread that I will give is My flesh, which I will give for the life of the world. Jesus said, “I am come that they might have life..
Jesus said, “Abide in ME..
No bread that is grown on earth will furnish food for the human heart. No nourishment for the body can suffice the deep need of the believer’s soul. 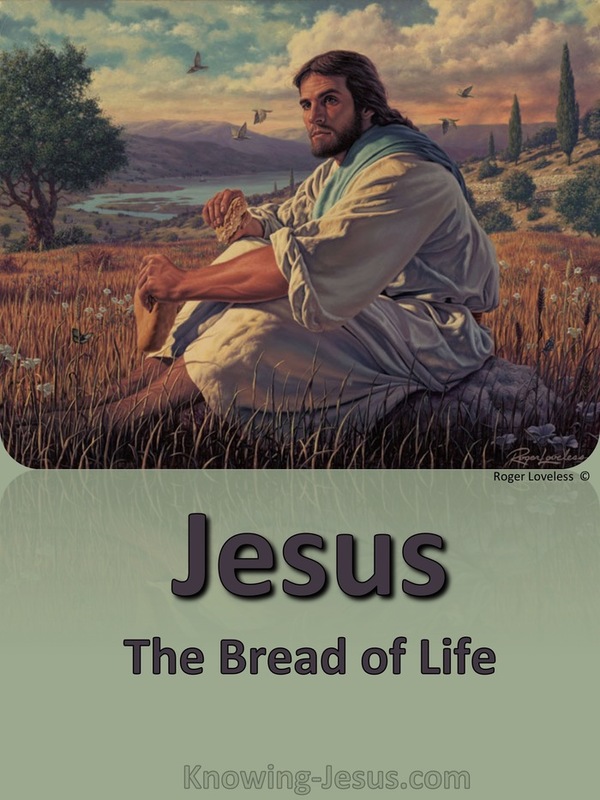 Jesus alone can satisfy the longings and desires of the hungry man, for He is the Bread of LIFE. Worldly strivings and fleshly ambitions may briefly sustain an earthly body, while the inner man dies of hunger, for lack of spiritual food that is eternal. The Manna that fed the Israelites was food for bodies – not for the spirit. 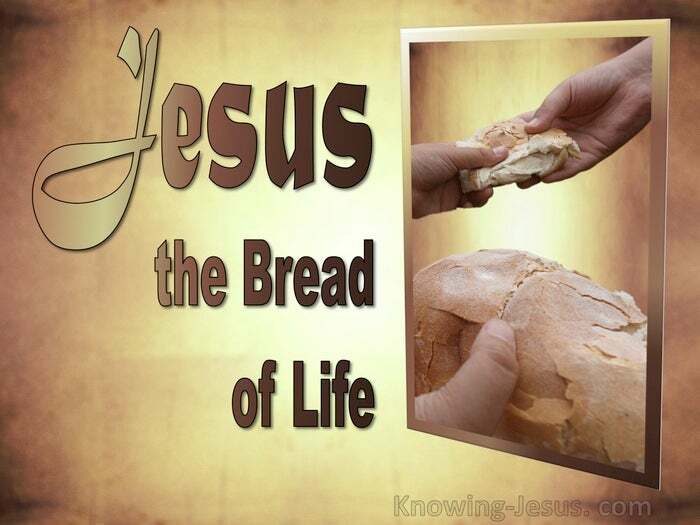 The Bread that truly came down from heaven – satisfies man’s deepest need. Spiritual bread is no bland wafer or tasteless slice of food. It tastes of mercy and forgiveness, grace and divine love. It is the living God that satisfies the gaping emptiness of the hungry soul. “I Am that Bread of Life” said Jesus, “come to Me and you will never hunger.” How is Christ the Bread of Life? What in the soul corresponds to the desperate cravings of a starving man? Another deep craving of the believer is HOLINESS. There is no art or make-up that can restore the human soul to moral beauty. No restoration can restore to original nobleness, a soul ravaged by the fires of life: there is none righteous, no, not one. Rom.3:8 – yet through His Spirit, Christ satisfies the hungry heart that aches for holiness. He fragments the proud “Self” – so as to pour in the healing oil of gladness. He empties the resident “Ego”- and fills up the aching void with Himself. He melts the arrogant “Me” – and gently warms the soul with His Beloved Son. He builds up anew with holiness and beauty the loveliness that sin destroyed. Satan has robbed many believers of their full ASSURANCE of eternal salvation, and many crave for reassurance of spiritual life here and eternal life to come. Many seek through good works and spiritual activity to confirm their acceptance.. but Jesus is the Life and the Way and the Truth and He alone can suffice. Jesus has given those who believe Life – and Life more abundantly. He has gone before to open a door – to prepare a home. Are you longing after God – desirous of His presence? Do you seek to be filled with His Spirit and overwhelmed by His Love? Do you yearn for forgiveness and holiness and assurance? Do you call out with Paul “That I may know Christ – that I may know Him? Then be reassured Christian – for this is the sign of a healthy spiritual state. He who hungers and thirsts after righteousness will be filled – and that’s a promise. Hungering for more of the Bread of Life is a most blessed thing. Thirsting for the Water of Life is a favoured state, and both will be satisfied. Those who seek Me shall find me when you seek Me with all your heart. Come unto me, all ye that labour and are heavy laden, and I will give you rest. If any man thirst, let him come unto me, and drink. Time is short : Jesus is coming again soon. Take time with Him : Embrace the moment. Delight in your lonely solitude : That I may know Him : Take time with Him : Come ye yourselves apart into a desert place, and rest a while..